Thursday October 9th 1884. It was wash day. Hatt and Jane Sanders was over We had a nice visit, and while Hatt was over here Ott had an upright piano sent down to her house. I worked some on my skirt and calico dress. Friday October 10th 1884. I made my calico dress skirt before noon and was in town all the afternoon. Weather pleasant. Saturday October 11th 1884. I was home at work all day. Mother and May went to the valley. Ida went to town in the afternoon. Sunday October 12th 1884. I was busy about the house all the morning Mother went to church. We were all to the cemetery in the afternoon and took a ride. I stopped at Hatts for supper and Ott came over to go to church with me. 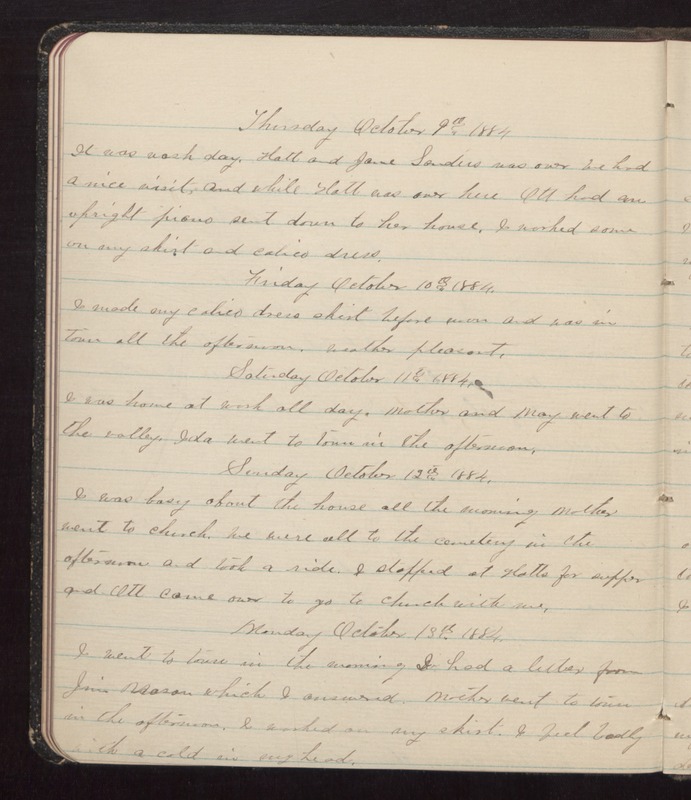 Monday October 13th 1884. I went to town in the morning I had a letter from Jim Mason which I answered. Mother went to town in the afternoon. I worked on my skirt. I feel badly with a cold in my head.